Scientific researchers in Britain, Norway and the U.S. are bringing us a major breakthrough in material science—by developing a “super strength” substance called graphene. 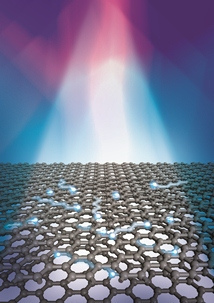 According to the Guardian (26 December 2012), graphene has “unmatched electrical and physical properties.” It’s made of an “atom-thick sheet of carbon molecules, arranged in a honeycomb lattice,” and promises to revolutionize telecommunications, electronics, energy industries, not to mention the untold applications for the military. - TV in your windows and mirrors—think you have information overload now? - Both larger and lighter satellites and space vehicles—imagine a skyscraper-size vehicle weighing less than your “patio barbecue grill”!